This Sunday we continued our study on the Book of Job. In our previous two weeks we considered Job’s complaint and God’s absence. You can read those two sermons at the following links: Suffering and the Question Why and The Absence of God. Today, God answers Job out of the whirlwind. It is a powerful and moving piece of scripture. You may want to read the article Preparing for Sunday: God Answers before reading or listening to the sermon. These words are from Revelation 21. They speak of the promise we have in God of a new heaven and a new earth. Where God will wipe every tear from our eyes, death, mourning, crying and pain will be no more. An exquisite promise that we find in God. A promise worth holding onto during the trying times of life. We are drawing towards the end of our time spent with Job. We have witnessed Job’s suffering. We have sat with him and asked the question why? Why is this happening? Why is a good person being made to suffer in such a way? Where is the justice in this? Where is God in this? How should we respond? What should we think? What should we feel? What should we believe? Job has endured countless hours of conversation with well-meaning friends. They have attempted to console him. To find an answer to his suffering. In all instances the response is that it must have been something that Job did. Job sticks with he has been saying all along, “I am blameless.” Job is convinced that nothing he has done, nothing he has said or thought would result in him suffering in such a way. He is blameless. We are privy to the truth. Job is blameless, he has done nothing wrong and yet he suffers. We have sat with Job as he endured God’s silence. Job has asked for an audience with God, for the opportunity to know why this has happened to him. In response all Job received was silence. Job experiences the profound absence of God. At the end of our reading from last Sunday Job was covered in darkness. Friends, the table is set for God to appear. In our reading today God makes one of the most dramatic and powerful entrances in all of scripture. The choice of how God addresses Job and his friends is meant to magnify God’s power and majesty. I dare say that if God chose to address any of us in such a manner our knees would buckle in awe. I believe we would be frightened. This is not God in the form of pastoral Jesus healing the sick and teaching. This is not the God the Holy Spirit sweeping through and breathing new life. This is the Lord God, full of power and might. At this point Job may be having second thoughts about an audience with God. However, before we get to God’s response let’s put God’s appearance in context. 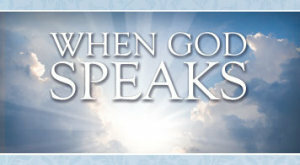 The speaker before God appears is Elihu. His speech begins in chapter 36 like this, “Bear with me a little, and I will show you, for I have yet something to say on God’s behalf.” When God appears we read that God addresses and questions Job. However, we need to remember that Job’s friends are still present. God’s questions are just as much for them as they are for Job. God asks “Who is this that darkens counsel by words without knowledge?” The answer is Job and his friends. The answer is you and me every time we hurl the questions at the feet of God. God’s answer is puzzling. The truth is it isn’t much of an answer. We might expect God to do one of two things when he arrives. The first is to inform Job’s well intentioned friends that they are wrong about how God works. To put them firmly in their place and to vindicate Job. The second thing we might expect God to do is to actually answer Job. To inform Job why he is suffering, why he has lost so much. However, God does neither of these things. Instead God opts to select door number three. Instead of correcting and instead of answering God decides to do something new. God decides to ask a few questions of his own. Friends, does Job provide us with an answer to the question why does a good God allow evil and bad things to happen in the world? The answer is no. No the book of Job does not provide us with an answer. Yes, Job’s innocence is upheld. Yes, we discover that Job’s friends have been wrong all along. However, after all of the doubt, all of the questions and all of the complaints when God finally does show up and answers Job out of the whirlwind Job’s questions, our questions, are never answered. Instead of answering God poses a new question, can humanity understand God and God’s ways. Over the course of four chapters God will question Job. These questions from God don’t make any sense to Job and his problem. However, God’s questions deal with the intricacy of creation. God takes Job and his friends on a safari. From the farthest reaches of the cosmos, to the crashing of the waves, the shape of the earth, the crashing of lightning, the arrangement of the stars, and the flight of eagles. From the common to the uncommon over these four chapters God takes Job on a tour of creation. Not hardly the answer I would expect from God in such a situation, but one which would surely take my breath away. And yet, and yet somehow it does make sense. In this reply we learn something about God. Did you notice the maternal image that is provided of God? When the sea burst from the womb and the swaddling garment for the clouds. God may not answer Job, but God tells us a lot about God through this response. We learn that God is surprising. We expect a lesson in theology from God. Instead we realize that God acts through creation in surprising ways. Remember that God also acted to save the world by arriving in the form of a baby in a manger. Remember that God shocked all the earth not by conquering through might and power, but through the selfless act of death. We should ask ourselves what response we expect from God when God deals with death by dying. With Job’s story we wonder if we must choose between God’s goodness and God’s power. The answer is neither. God isn’t interested in retributive justice. God is interested in grace, God is interested in creation. Creation matters to God else the Bible would not begin as it did, nor would it end the way it does. In his response to Job God reframes the entire question to such a point that we wonder what the question we were asking was in the first place. In the movie The Tree of Life Terrence Malick directs a film which explores Job’s question. The movie weaves a tale of loss through the lens of one family. It is powerful, evocative and confusing as such a tale should be. Malick opens the movie with a quote from the Book of Job, “Where were you when I laid the earth’s foundation … while the morning stars sang together and all the sons of God shouted for joy?” A piece of trivial for you the main characters initials spell Job. In the middle of the narrative Malick provides what can only be described as a journey through God’s response to Job. It is a fifteen minute sojourn that left me speechless in its scope, just as God’s questions to Job rendered him speechless. Friends, the answer to Job’s question is found in Jesus Christ. God’s answer to Job reminds us how much God cares about everything. Amen.